Great River Hydro, LLC (“Great River Hydro”) is the owner and licensee of the Wilder Hydroelectric Project (FERC No. 1892), the Bellows Falls Hydroelectric Project (FERC No. 1855), and the Vernon Hydroelectric Project (FERC No. 1904). The current licenses for these projects each expire on April 30, 2019. On October 31, 2012, TransCanada initiated the Integrated Licensing Process by filing with the Federal Energy Regulatory Commission (“FERC” or “Commission”) its Notice of Intent to seek new licenses for each project, along with a separate Pre-Application Document for each project. With this filing, Great River Hydro submits its March 8, 2018 Updated Study Results Meeting Summary for the three projects, as required by 18 C.F.R. §5.15(c)(3) and the Commission’s current Process Plan and Schedule (dated February 15, 2018). The meeting for the Updated Study Reports filed between May 1, 2017 and February 9, 2018 was held at Great River Hydro’s Renewable Operations Center in Wilder, Vermont, with teleconference and call-in capability for participants who could not attend in person. ILP Schedule – Brandon Cherry reviewed the Revised Process Plan and Schedule FERC issued on February 15, 2018, noting that GRH is required to file a progress report on May 15, 2018 and every 90 days thereafter until studies 9 and 24 are completed. The progress report is to include the status of study 33 – Cultural and Historic Resources Study. Study 33 – Cultural and Historic Resources Study – Rich Holschuh concurred that this study is still open and indicated that while the draft TCP includes timetables for consultation, no consultation has taken place. John Ragonese disagreed that no consultation had occurred, citing several meetings with native American tribal leaders and informational resources but recognized the present open status of the study. He said the Programmatic Agreement (PA) and Historical Properties Management Plan (HPMP) are in development and will be shared for comment and review. The PA is a signed agreement among affected parties that usually includes SHPO’s, licensee and federal tribe(s). GRH suggests that no federal tribe is affected by this PA, but local tribes are and therefore should be included. The PA will reference the HPMP which includes details of how properties will be managed. 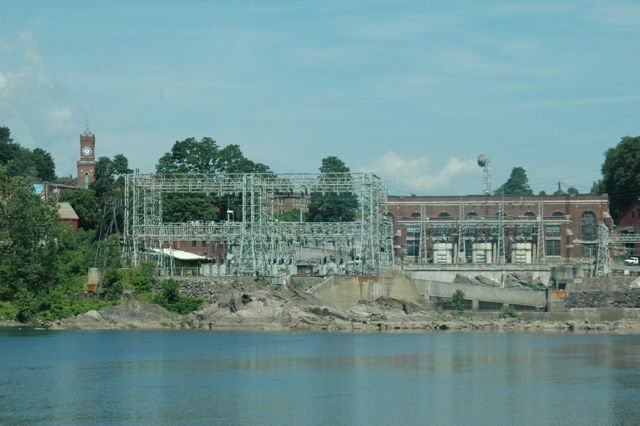 A key state agency has signed off on the sale of 13 hydroelectric stations to a Boston company. The Vermont Department of Public Service – whose job is to represent the public interest in energy matters – has approved a deal pledging to support Great River Hydro’s proposed purchase of TransCanada’s dams on the Connecticut and Deerfield rivers. Read the full story by Mike Faher at VTDigger.org. The Vermont Commission on Native American Affairs approved a proclamation in support of North Dakota tribes, 14 days before the new president announced he would resume two controversial pipeline projects. The commission “proclaims support for those protectors at Standing Rock, N.D., who are resisting destruction of sites sacred to Dakota, Lakota and Nakota people, disruption of traditional ways and potential environmental contamination from crude oil pipeline construction and use.” The entire document can be found here. Commissioner Joelen Mulvaney drafted the document, which was discussed and approved during the commission’s Jan. 11 meeting. Read the full article by Chris Mays in the Brattleboro Reformer. Photo by Kristopher Radder of the Brattleboro Reformer. 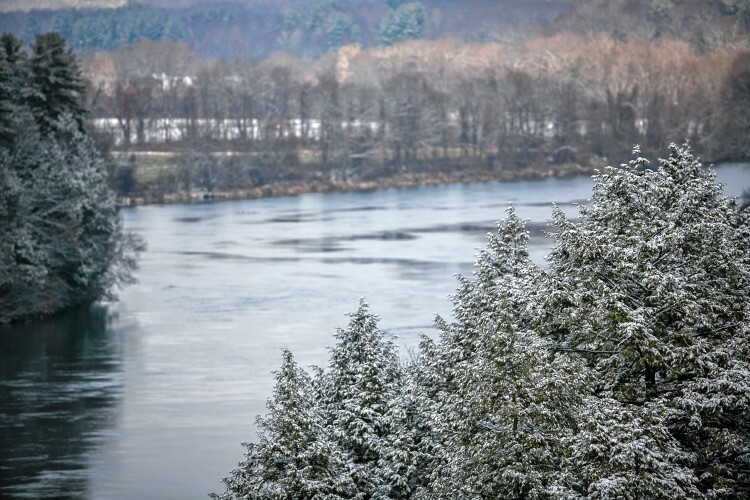 The Franklin Regional Planning Board and the Connecticut River Streambank Erosion Committee have responded formally to a study that largely clears Northfield Mountain pumped storage project of blame for river bank erosion. The response to the Federal Energy Regulatory Commission about FirstLight’s operation of the hydroelectric project criticizes the methodology used and arguments made in the study, which was submitted in September. The study is part of a relicensing application for hydroelectric plants along the river. Full story by Richie Davis in the Greenfield Recorder. Observations: The combined operational impacts of the Northfield Mountain Pumped Storage and the Turners Falls Hydroelectric Projects, utilizing what is known as the Turners Falls Impoundment (TFI) on the Kwanitekw/Connecticut River, contributes to the accelerated erosion of the banks for 20 miles. 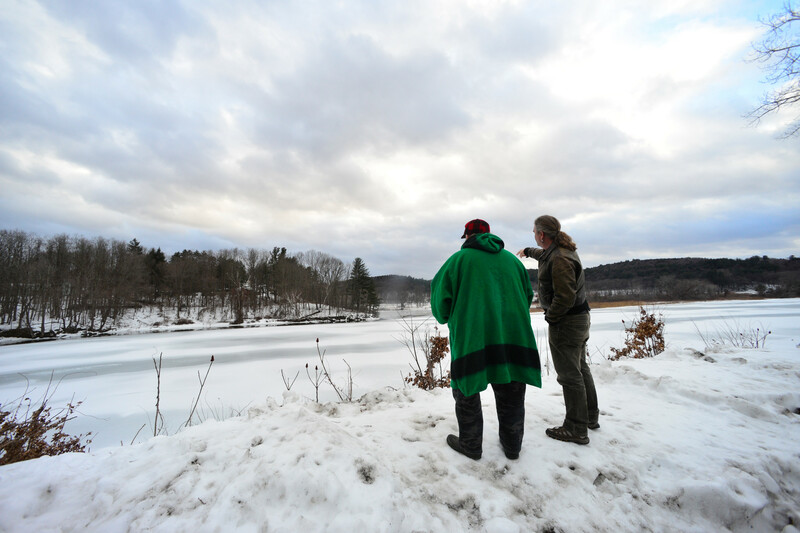 Effects upon this entire stretch of the river are highly sensitive for the Sokwakiak Abenaki people and their ancestors; it is the heart of the lower Sokoki homelands, today’s Northfield, MA being the derivative of the Native settlement known to the British settlers as Squakheag. Both sides of the Kwanitekw – from the site of the Vernon dam south to the corresponding Turners Falls structure – were occupied for millennia before the arrival of the Europeans (as well as areas further north, above the TFI). The landscape remains sacred to the People, a part of the collective cultural consciousness, with sacred sites, stone structures, burials, and long-established relationships embodied within the land and water. The constant raising and lowering of the river’s surface level due to daily operations of the Projects, unlike a natural alluvial river system, is accelerating the destruction and loss of this ancient homeland, and compromising the relationships necessary for the community’s vitality.